Help to Set Shahidul Alam Free! On the evening of August 5, 2018, esteemed photographer and founder of the Drik Photo Agency, the Pathshala South Asia Media Institute and the Chobimela International Festival of Photography, Shahidul Alam, was seized by about 20 plainclothes policemen from his home in Dhaka, Bangladesh. He was arrested under the controversial Section 57 of the Bangladeshi Information and Communication Technology (ICT) Act for making statements in the international media about police brutality in putting down a protest by students in which more than 100 people were injured. I got to know Shahidul in the early 2000s and together with an Englishman, Colin Hastings, we founded the Majority World Photo Agency in 2004. He is a highly accomplished photographer. As the UK’s Guardian newspaper said, “[h]is photographs have been published in almost every major western media outlet, including the New York Times, Time magazine and National Geographic in a career that has spanned more than four decades.” He is a humanitarian of great stature in his home nation of Bangladesh. He has also done more than any other person I know of to promote Majority World photography in the international media. In fact the very concept of the Majority World (as opposed to Third World or Two-Thirds World) was created by him. 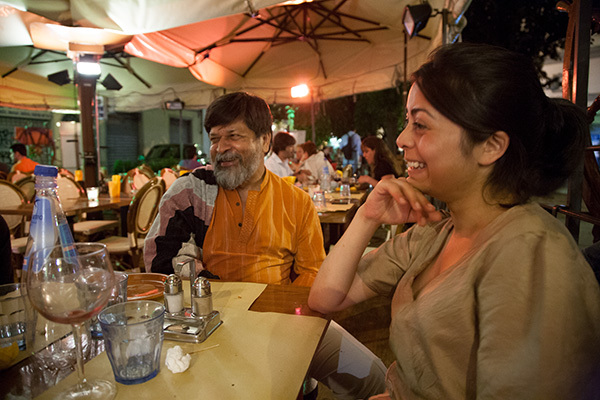 Director of Drik Photo Agency, Pathshala photo festival and the Majority World picture library, Shahidul Alam (left) with his daughter at a restuarant in Florence, Italy during the CEPIC Congress or picture libraries that was being hosted in the city in June 2007. Shahidul has won numerous international awards for his work including the 2018 Lucie Award for Humanitarian photography, the Harvey Harris Trophy in 1983, the Mother Jones Award for documentary photography in 1993, the Andrea Frank Foundation and Howard Chapnick Awards in 1998, Shilpakala Padak in 2014 by the President of Bangladesh, and the Lifetime Achievement Award in 7th Dali International Photo Exhibition in China in 2017. It is not surprising that his arrest has sparked significant international outcry from the likes of Amnesty International, the Committee to Protect Journalists (CPJ), PEN International, the South Asia Media Defenders Network and publications such as The Guardian, The New York Times and The Washington Post. Shahidul needs our help! Please sign the petition on Change.org below to add your voice to the many asking for his release and if possible, write to Bangladeshi government officials and the Bangladeshi High Commissioner in Pretoria H.E. Mr. Shabbir Ahmad Chowdhury.